Sleeping Bear Press, 9781585368969, 32pp. Dozer the Goldendoodle has a wonderful life He and his best friend, Chica, belong to a loving family. They have warm beds to sleep in, enough food to eat, and plenty of room in their yard to play and investigate. What more could a good dog want? As it turns out, Dozer wants an adventure. And when a runner runs past his yard, followed by another, and another, and another, Dozer decides to follow and see what is happening. In May 2011, unbeknownst to his owner, Dozer slipped out of his yard in Highland, Maryland, enticed by the sight of people running past. The runners were participating in the Maryland Half Marathon, a race benefitting the University of Maryland Greenebaum Cancer Center. Dozer joined the 2,000 runners in the race, inspiring everyone along the 13-mile race course. 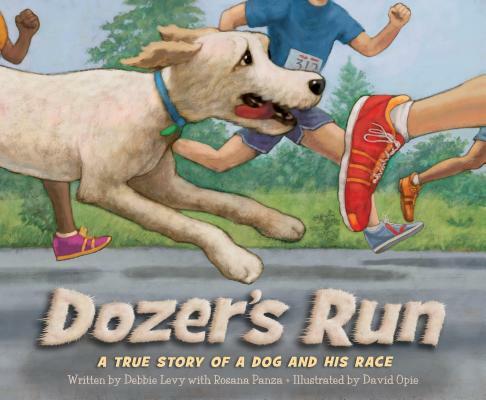 By the time his adventure was over and he was reunited with his family, Dozer's "Run" encouraged thousands of pledges in support of the Greenebaum Cancer Center. This true story of a playful dog that actually runs a half marathon entertains as well as inspires.